In a previous article we discussed the Washington-Moscow Hotline, being the most famous bilateral hotline. It was soon followed by direct communication links between a number of other countries with nuclear capabilities. In general these hotlines started as a teletype connection, being upgraded with facsimile units in the eighties and were eventually turned into dedicated secure computer networks. An exception is the hotline between Washington and London, which was a phone line already since 1943. 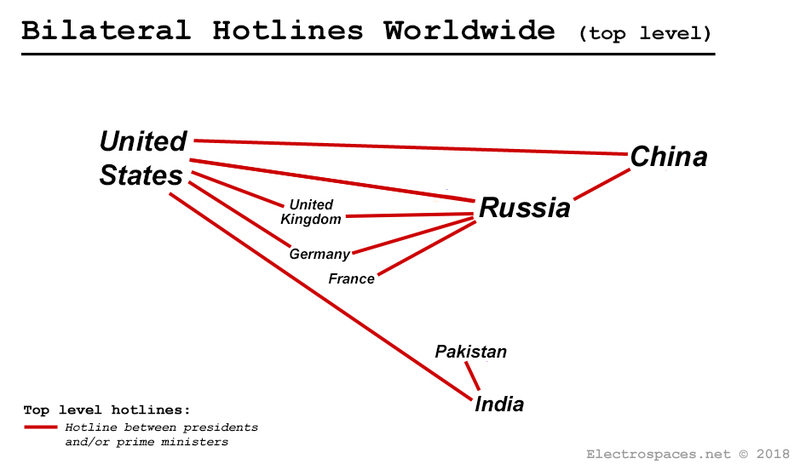 The hotlines between the heads of governments, are meant to prevent (nuclear) war in times of severe crisis. For preventing misunderstandings and miscommunications in less critical situations, countries have also set up lower level telephone hotlines between their defense or foreign ministers. For example, the United States has so called Defense Telephone Links with at least 23 other states. - In 1963 the United States and the Soviet Union established the Direct Communications Link (DCL) or Washington-Moscow Hotline. This highly secured connection originally used teletype machines, which were replaced by facsimile units in 1988 and is using e-mail since 2008. - In 1990 both countries agreed to establish a direct, secure telephone link between Washington and Moscow. This might be the Direct Voice Link (DVL), which is maintained by the White House Communications Agency. - In 1988 the Nuclear Risk Reduction Center (NRRC) was established at the US Department of State, which is used to exchange information in support of arms control treaties. After the split-up of the Soviet Union this secure data exchange connection, called Government-to-Government Communication Link (GGCL), was extended to Ukraine, Belarus, and Kazakhstan. Since 2013, the NRRC also maintains a communications link with Russia for the exchange of information about cybersecurity risks. - In 2000 the US and Russia signed an agreement for the establishement of a Joint Data Exchange Center (JDEC) to share early warning information on missile and space launches to reduce the risk that a test launch could be misread as a missile attack. It's not clear whether this center has already been realized or not. - There is a secure telephone line called Foreign Affairs Link (FAL) between the US Department of State and Russia (since 1999), Japan, Mexico, Germany and Israel. - There is a Defense Telephone Link (DTL) between the US Department of Defense and Russia (since 1994), China (since 2008), Albania, Oman, Qatar, Latvia, Lithuania, Slovenia, Saudi Arabia, Ukraine, Bulgaria, Kuwait, Estonia, Slovakia, Kazakhstan, Macedonia, Bahrain, Israel (since 1996), United Arab Emirates, Poland, Romania, Czech Republic and Austria. - In September 2011, the United States proposed opening a direct military hotline with Iran to avoid a possible conflict erupting over the Iranian nuclear program. Tehran declined the offer. - In 2013, a direct secure voice line was established between the US Cybersecurity Coordinator and the deputy secretary of the Russian Security Council in order to manage crisis situations arising from cybersecurity incidents. - During World War II, two decades before the hotline Washington-Moscow was established, there was a hotline between the Cabinet War Room bunker under Downing Street and the White House in Washington. From 1943-1946 this link was made secure by using the very first voice encryption machine, called SIGSALY. In the 1950s and 1960s the Washington-London hotline was secured by the KY-9, probably succeeded by the KY-3 voice encryption devices. In the 1980s, the STU-I system was used, to be replaced by a small version of the IST red phone. - In 1962, a hotline was established between the White House and the German chancellor's office. Initially, this was non-secure, standard telephone line. In 1969 it was probably replaced by a secure teletype link and since the late 1970s it consisted of secure STU-I telephone sets. Somewhere in the 1990s these were replaced by a small version of the IST red phone. - On April 29, 1998 the United States and China signed an agreement to set up a direct telephone link between the presidents of both countries. - On February 29, 2008 both countries agreed to set up a Defense Telephone Link (DTL) between the US Department of Defense and China’s Ministry of National Defense, which became operational in April 2008. Until 2011 this hotline was used only four times. - During a visit of US president Obama to India in January 2015, it was decided to set up a secure hotline between the White House and the Indian prime minister. The link became operational in August 2015 and was said to be established with the help of the US military. - A hotline connection between Moscow and Bejing was used during the 1969 frontier confrontation between the two countries. The Chinese however refused the Russian peace attempts, and informed Moscow that the direct communications link "was no longer "advantageous" and normal diplomatic channels would suffice". After a reconciliation between the former enemies, the hotline between China and Russia was revived in 1996. * It's not clear whether this hotline is for record or voice communications. - A telephone hotline between the defence ministries of Russia and China became operational on March 14, 2008. - Since 1967 there was a direct teletype connection between the British prime minister and the Kremlin. In 2011 this hotline was upgraded to a better-encrypted telephone link. - In 2009 Israeli prime minister Ehud Olmert and Egyptian president Hosni Mubarak agreed to pass on relevant intelligence information immediately using a hotline, primarily to combat smuggling from Sinai into the Gaza Strip. - After the 1971 war between India and Pakistan, a secure communications link between the Prime Minister Secretariat in Islamabad and the Secretariat Building in New Delhi was established, but it was seldom used until the 1990s. - In 2004, both countries agreed to set up an additional secure hotline between their foreign ministers, aimed at preventing nuclear risks. - In 2011, India and Pakistan agreed to set up a 24/7 non-encrypted hotline between their interior ministers, that will facilitate real-time information sharing on terrorist threats. - Since 2005 there's a non-encrypted hotline between the foreign ministers of India and China for building "mutual political trust". - In 2009 both countries agreed to set up a direct, secure telephone link between the Chinese premier and Indian prime minister, which was meant as a confidence building measure and to maintain regular contacts at the highest level. The agreement for this hotline was signed in April 2010. - There's also a non-encrypted hotline between Delhi and Moscow, which was established before 2009. - A first telephone hotline between North and South Korea became operational on September 22, 1971. Many low-level phone lines between both countries followed, until there were 33 lines through Pamnumjom and 15 lines outside that border town. A top-level telephone hotline between the presidents of North and South Korea was established on April 20, 2018, in preparation of a summit between both leaders. - In September 2012, China and South Korea agreed to set up a consular hotline between their defense ministries to protect rights of their citizens who are staying in the other country. In April 2013 both countries agreed to set up a second, 24-hour hotline to deal with the rising tension over North Korea. - In June 2013, China and Vietnam agreed to set up a naval hotline between their defense departments, in order to keep a peaceful and secure maritime environment in the South China Sea, amid escalating maritime tensions over disputed South China Sea islands. In 2010, China and Japan agreed to establish a hotline between their political leaders, following a series of naval incidents, but the plan wasn't realized. Defence officials of the two countries also agreed in 2011 to set up a military-to-military hotline by the end of 2012, but the talks stalled due to heightened tensions over the territorial row. In February 2013, Japan again suggested to establish a China-Japan hotline, and reiterated this once again in January 2014. In September 2016, China and the Southeast Asian countries decided to set up hotlines and adopt communications protocols to avoid potential naval clashes in the disputed waters of the South China Sea. When more information about these hotlines becomes available, it will be added here. 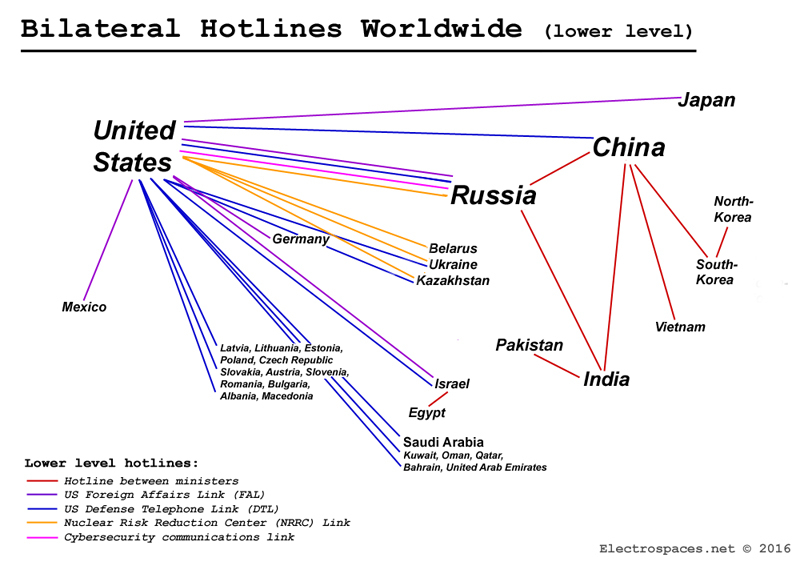 Some of the most notable bilateral hotlines will be discussed later on this weblog. Last week, David Petraeus resigned as director of the Central Intelligence Agency (CIA), after admitting he had an extramarital affair with his biographer Paula Broadwell. This led to many news reports and also many pictures on the internet. 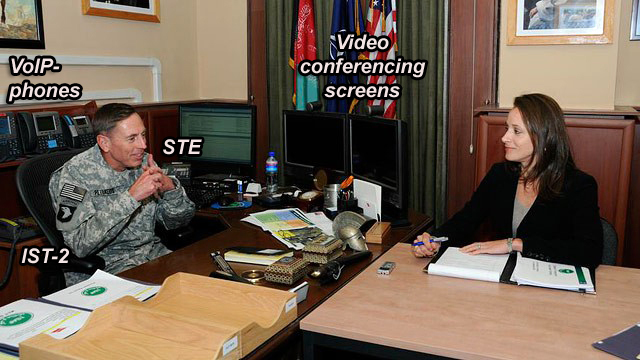 On Petraeus' desk we see two Centric 1700 MXP video teleconferencing screens, made by the Norwegian manufacturer Tandberg. In 2010 this company was bought by Cisco Systems, and so the 1700 MXP screens are often used by US military officials. They are equipped with a HD camera and have a widescreen LCD screen, which operates both as a video conferencing system and PC display. Left of the personal computer screen we see a Secure Terminal Equipment (STE), made by L3 Communications. The STE is a phone capable of encrypting calls up to the level of Top Secret/SCI. This phone can be used to have a secure line to anyone with a similar device. 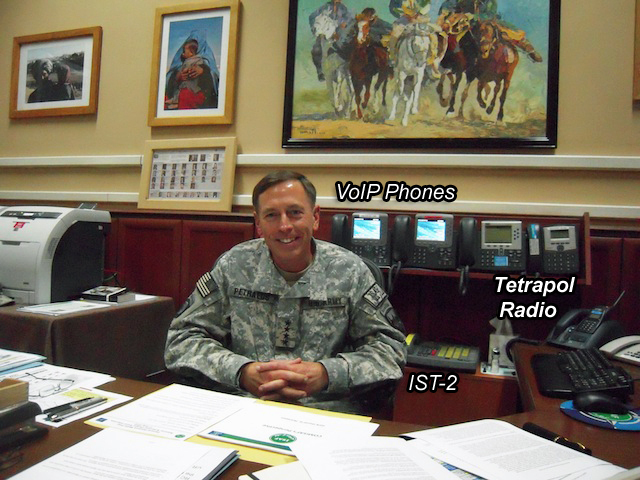 Right behind the chair of commander Petraeus is an Integrated Services Telephone 2 (IST-2), made by Telecore Inc. This is a so called "red phone", which is part of the Defense Red Switch Network (DRSN), connecting all mayor US command centers and many other military facilities. This is the primary telephone network for military command and control communications. In the picture above we see three of four Voice over IP (VoIP) phones: at the right end a Cisco SPA and the other three being phones from the Cisco 7970-series. It's likely each of these phones is part of a separate telephone network. Nowadays many military phone networks use Voice over IP, often with Cisco IP phone sets. These phones have no encryption capability, but their voice data networks can easily be secured with specific network encryptors. 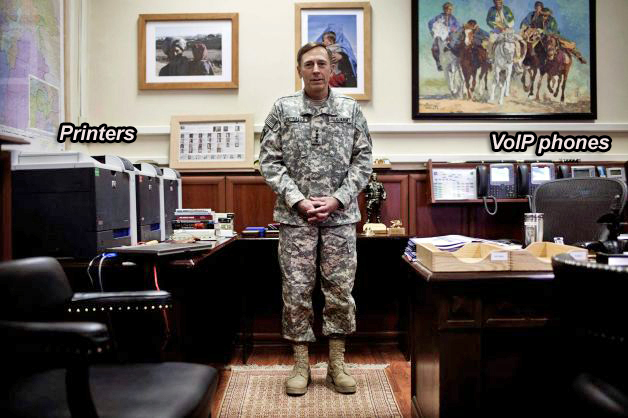 General David Petraeus in his office at the ISAF headquarters in Kabul. Also in this picture we see three printers on a table at the left side of the room. Apparently there are separate printers for different computer networks, in order to keep documents of different classification levels separated. At the upper left corner of the front of at least the first two printers we can see the colored classification labels: a green sticker for Unclassified materials on the printer in the foreground and a red sticker for materials classified as Secret on the printer in the middle. The third printer seems to have no marking, but we can assume this one is for Top Secret (orange sticker) or Classified SCI (yellow sticker) documents. This kind of communications equipment is typical for US military commanders in similar positions. Therefore one can quite easily recognize it also on other pictures of American military commanders and command centers. Contrarily, pictures in which we can see the equipment used in Petraeus' last office, that of director of the CIA, are very rare - but we keep looking! The Tetrapol secure voice and data radio network was installed in 2004 by Cogent Defence and Security Networks, the UK operating company of EADS Defence and Communications Systems Group. This trunked Tetrapol ISAF Command Network, with end-to-end security, provides command communications coverage for the NATO Area of Responsibility in the Kabul region.